Tuesday marked what could be a historic turning point in efforts to opt-out of Secure Communities now that the process has been outlined by three high-level federal officials. “We are not here to do the job of ICE,” said Supervisor George Shirakawa. Dozens of onlookers gave the supervisors a standing ovation. b. Identify the actions that would be required of Arlington County regarding notification to ICE of “suspected criminal aliens” once Arlington becomes a non-activated community. 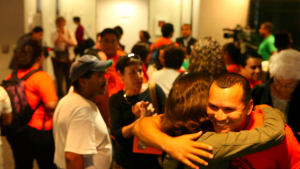 Immigrant advocates in Arlington County celebrate after the opt-out vote. The vote was welcomed by elated cheers from immigrant activists and union members who’d gathered to support it. Until now, only Washington D.C. had passed an opt-out resolution. Local officials in all three areas have expressed concern that the program had been activated without their approval. Secure Communities shares arrest data from local jails with immigration agents. If ICE finds a match it can ask the jail to hold the person until they’re taken into federal custody. The program is supposed to target high-level offenders, but data released by ICE shows many of those identified committed traffic offenses or other small crimes. Concerns about the program range from the distrust it creates between immigrant residents and local law enforcement agencies, to fear that police will target innocent people based on their ethnicity in order to check their status once they are brought to jail. A child and his parents enjoy the vote in Arlington County. Now immigrant advocates say they hope to launch similar opt-out campaigns elsewhere in Virginia. Secure Communities is currently active in all 129 of the state’s counties. Nationwide, Secure Communities is active in 632 jurisdictions in 32 states. In May, San Francisco’s Board of Supervisors also passed a resolution by a vote of 9 to 2 requesting to opt out of the program and Sheriff Hennessey resubmitted an opt out request letter to ICE earlier this month. Governors in Colorado and Washington are considering opting-out at the state level. This entry was posted in Press (California), Press (Virginia) on September 30, 2010 by Ian.